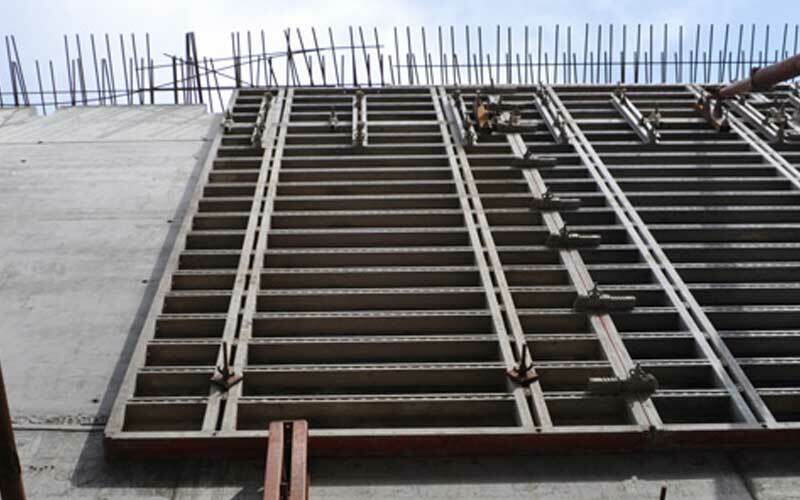 NOEtop is a high strength formwork panel system used for efficient casting of walls in a wide variety of applications. The NOEtop range possesses one of the largest panels on the market, 5.3m x 2.65m (14.05m²) with a working pressure of up to 88kN/m². With its integrated, built in strong backs the NOEtop panel is a versatile system which can transform itself at random from a modular large panel system into a large area gangform. The NOEtop system also ensures a safe work place with self-locking walkway brackets that can be positioned on either a horizontal or vertically placed panel. Easy and safe stabilising of the forms can be achieved using push pull props. Frames and profiles are hot-dip galvanised both inside and out ensuring a long and economical service life. All panels are provided with cast iron corner blocks to provide further protection. The NOEtop panel system is available in a variety of panel sizes together with a wide range of internal, external and hinged units for additional flexibility.